AAF Newsreels 1935: Explorer II, Thompson and Mitchell Trophy Races, First commercial airmail, China Clipper in Manila, Boeing XB-17, New base Hamilton Field, Army Airship TC-14. 33 minutes. USS Saratoga (CV-3) 1935: 8 minutes. AAF Newsreels 1936: Nation speed programs for Air Warfare, Great Flood Aftermath, AAF "Flying HQ", Bombing Hawaii volcano to divert lava, Sub-zero war games, Berlin Zeppelin, AAF rushes planes, World's biggest bomber, AAF over Lake Tahoe, New air cam. 27 minutes. 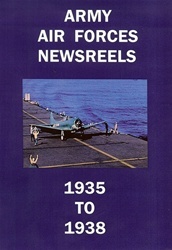 AAF Newsreels 1937-1938: Selfridge Field exercises, A-11's, A-17's, B-10's, AAF and Army Ground Forces, Va., B-17A's Seattle, B-10's, March Field, CA., Stearman PT-13's, Bell XFM-1, West Point Cadets, XB-15, Autogiros. 19 minutes. US Army Carries On 1937-1940: US Army maneuvers. 10 minutes. Wings Of Peace: Goodwill flight to South America. 10 minutes. USS Lexington (CV-2) 1938: Historical film, Drydock, planes land and take off, San Francisco. COLOR, 5 minutes. 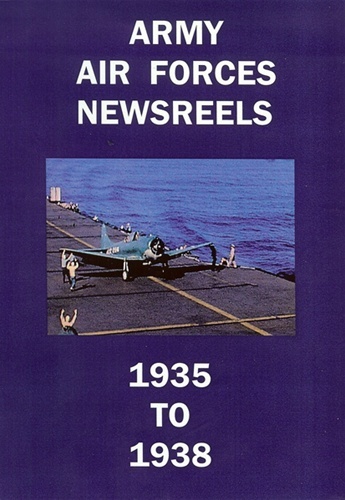 Total run time for Army Air Forces Newsreels 1935-1938 DVD is 1 hour, 52 minutes in B&W and color. Format is NTSC DVD.